Late nights. Weariness. Grief. Worry. Stress. Laughter. Change. Growth. Thankfulness. Joy. Grace. Those are the words that come to mind when I look back on 2016. It was a year mixed with joy and sorrow. By God’s grace, we made it through the challenges and changes of 2016. 2016 began with my dad in the hospital. After being in the hospital for about two months, my beloved daddy went to be with Jesus. We spent many of the following months helping my mom go through Dad’s things, sell what she could, then put her house up for sale, buy a new house, and move to a new city. Two of my girls finished their time wearing braces and that freed up some of my time, since I wasn’t having to drive them to appointments (one in a town one hour away, and the other in a city two hours away). We asked God for a piano, and He answered with a free one from a new friend! Thus began a new routine of driving to piano lessons. We were able to take our dream trip to Florida this summer. I think that was the highlight of the year for us! With all of the changes we’ve endured this year, I’m definitely not the same person I was before. I discovered a strength that I didn’t even know was there. I had to lean on God and lean into His grace, and He carried me through so many of the trials I had to walk through. There were things that were way out of my comfort zone that stretched me and grew me into a stronger woman. These things were uncomfortable for me at the time, but they were necessary for growth. I’m definitely not the same person I was last December. Every year I use the weeks before Christmas and the week after Christmas to think about the coming year and what I hope to accomplish and who I hope to become. I always get a new planner and start making plans filled with hope and anticipation. As I looked back over the goals I made last year, I noticed that the goals I have for 2017 are extremely similar to the ones I made last year. Honestly, there were many things that just didn’t happen in 2016, due to circumstances beyond my control. I did the best I could, but it was just a hard year. So, what do I do? Give up on setting goals because I didn’t make as much progress as I would have liked? If you’re like me, and you’ve experienced setbacks and difficulties in your year (and you’re hesitant to set goals because you might not be able to make them happen), I would like to suggest that you try grace-filled goal setting. Give yourself grace! Don’t aim for perfection, but instead aim for progress. Rather than consider myself a failure because my goals for this year weren’t perfectly fulfilled, I’m going to choose to look at the progress that was made on each goal. I’m looking at the past year, remembering my weakness and the struggles I had to endure, and I’m going to give myself grace. Instead of seeing failure, I’m choosing to see growth. I did a lot of growing in 2016. It didn’t turn out the way I had envisioned. But I did grow! That’s something, right? I want to encourage you today to give yourself grace, and see the good in the past year. What changes happened for you? Even if the year was hard, filled with grief or trials, did you grow? That’s progress! As you reflect over the past year and look forward to the next, write down what worked and what didn’t. Write down what you have to be thankful for. If there were things that didn’t work, take note of those, too. Specific: Make sure you know exactly what you’re trying to accomplish. Measurable: Make sure each goal is quantifiable so you’ll know when you’ve accomplished it. Actionable: Make sure it’s specific and action-oriented. Realistic: Make sure your goals are possible for you. Time-Bound: Make sure you set a date for completion. And then, after setting those “smart” goals, give yourself some grace! If something happens to derail your plans, look for whatever good came out of that change of plans. Look for the growth! I can honestly say that despite the challenges 2016 threw at me, I still accomplished more with my goals than I would have without them. I see so much progress, even though I didn’t perfectly complete any of the goals I set. Even if it’s not perfect, it’s still worth it to think through the coming year and set some goals. Aim at something you’d like to see happen in 2017! While I did set some specific goals for 2017, they’re so similar to the ones I set last year that there’s not much point in sharing them here. 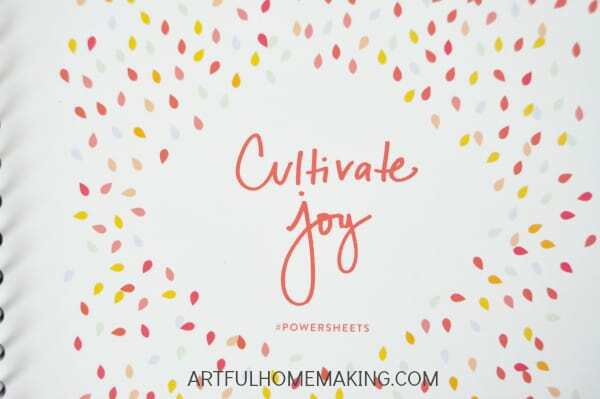 🙂 I LOVE going through the goal-setting process with my PowerSheets Intentional Goal Planner. I honestly believe this is the best tool available for goal setting, and it has really inspired me to be intentional with my time and life. Every year I like to pick one word to focus on through the year. A word that sort of defines and sums up what I’m working toward. I know there are varying opinions on whether or not it’s helpful to pick a word to focus on, but I’ve been picking a word for several years now (here’s my word for last year), and I find it to be a helpful practice, so I keep doing it! To cultivate anything requires attention to detail, an understanding of what is being cultivated, and a lot of patience. 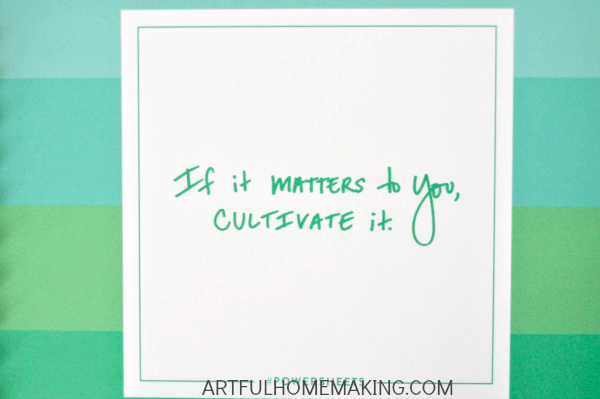 Cultivate: to prepare, to work on, to improve the growth by labor and attention. Isn’t that a lovely thought? Giving attention to all of my goals, as if I were a gardener tending plants. And then hopefully seeing GROWTH! 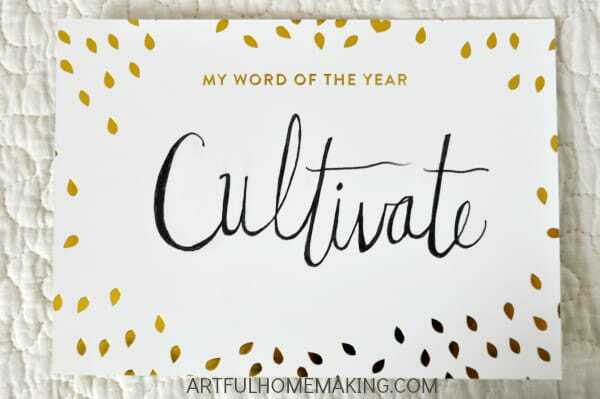 As I began to ponder my goals this year and think about a word, “cultivate” kept popping up EVERYWHERE. You know how that is? You see it in one book, and you think, “that’s nice.” Then you see it again, in a completely different place. And then you’re listening to a podcast, and you hear it again! Well, that’s how it was with “cultivate.” It was like I just couldn’t get away from it. And the more I thought about it, the more enamored I became with it. It just had to be my word for this year. There are so many things I want to grow in my life this year. And so, I’m thinking about my goals in terms of growth, and change, and living an intentional, flourishing life. I can’t wait to cultivate some beautiful things in my life this year! Marriage, mothering, faith, community, hospitality, health, and so much more is in my heart. Will 2017 be a perfect year, with all of my goals neatly checked off and accomplished? Well, that would be a miracle, so probably not. I’ve never yet experienced perfection in any area of life. But I can look for progress. There can always be progress as we work toward our goals, little by little! Set some good goals and then give yourself grace! Most importantly, look to Jesus. We can’t do this without Him. PowerSheets Intentional Goal Planner (This is a game-changer in goal setting! It’s definitely the best goal planner out there.) All the photos in this post are ones I took of my planner and accessories. The Living Well Planner This is the daily planner I’ve chosen for 2017, and it goes perfectly with the PowerSheets Goal planner, because after making your goals, you can transfer them to the goal planning pages at the beginning of each month in the Living Well Planner! Read my review of this planner here. Disclosure: This post includes my affiliate links. I purchased these items myself, and I only recommend things I use and love personally! Read my full disclosure here. Sharing this post here. Wow. Awesome Post. Thanks for sharing!!! Cultivate is a really great word to focus on for 2017 – I can see some real growth happening there :-). I know that God will help you to see the fruit that he will be cultivating in your life this year. All the best Joy! Thanks so much for the encouragement, Ami! All the best to you in 2017! 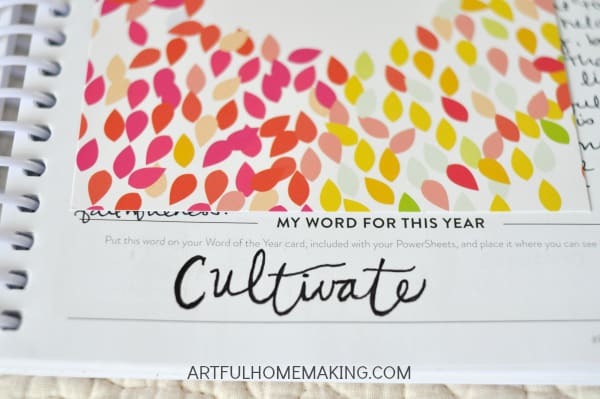 Cultivate…that is a wonderful word for the year! A very good idea to pick a word for the year. One of the best things that I have ever learned through all the years is that the Lord is strong when I am week. He is always there and I can trust in Him completely! As the new year is upon us, it will be no different. A comfort…yes. Knowing this gives me courage for each new day. Praise God for his mercies are new every morning! I so agree, Jennifer! The Lord is our refuge and our strength. I’ve been reading in the Psalms this month, and that phrase is repeated over and over again. Such a comfort, and as you said, it gives us courage. Thank you so much for stopping by and leaving an encouraging comment!